I quite frankly wasn’t expecting that one… Over the very first listen there wasn’t much that just hit me. It wasn’t overly impressive and it wasn’t really “novel” in any way, but I kept coming back to listening to that album. I didn’t really know why, but there was something drawing me towards it. And now, after quite a bunch of listens, I can safely say that I really like the album. It’s good, well varied, nicely constructed, and the fact that it’s a live recording (with ulterior overdubs) makes it all the more interesting. Kooba Tercu is the work of “Johnny Tercu and his crew” who distilled the ideas developed over a couple years of jamming to create ten songs and a full length album, at around 40 minutes in length. Some really cool rhythmic, melodic and arrangement ideas have come out of this process, and the whole reminds me somewhat of 70’s psychedelic prog rock, but more modern influences of metal and other psychedelic bands. Each song is well defined and no two are the same, and you can’t really take one for another either, they each have their own personality. The album sounds like one huge drug experience, but a rather pleasant one, even when sometimes you feel out of place and floating amidst colours and shapes, but still find beauty in it. I believe, then, that “stoner” is a good adjective to place before the actual genre the band plays, which would then go something like “stoner psychedelic hard rock”. No track is very long but they each flesh out the ideas they introduce pretty well and they are not repetitive or boring. There are vocals on the album, harsh and clean ones, but they are not what we’d call the center of attention, in that they never get in the way of the music but rather support it, flow with it. 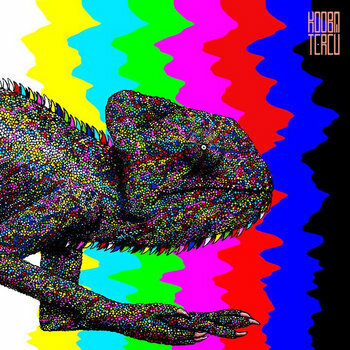 In the end, Kooba Tercu is a great debut album from the Greek band, and I’ll be anticipating their next jam experiment with fairly high standards. It’s a fun listen that I believe everyone can enjoy, that’s if you have any friends to share this with. ← News: Om Mani reunite!